Search 'real vs fake tree' on the Internet and you'll quickly see this is a long-standing debate with no clear-cut outcome. Green Promise has compiled the data for you to make your choice. Pull up a spot on the proverbial fence, because the real vs. fake Christmas tree argument won’t be solved anytime soon. To say that having no tree is — indisputably — the best option for the environment may be going just a bit too far. Things are looking up for the real tree camp, but not in the way you might expect. Potted Christmas trees can hang out year-round in your yard (apartment- and condo-dwellers, don’t try this at home) and be brought indoors for the holiday season, albeit only for about a week. For those of you that don’t have the outdoor space for a potted tree, you may have luck buying and then donating your potted pine to a local organization that will happily plant your tree. Sounds nice, but probably too much work for the average busy consumer. But, if you live in the Portland or San Diego areas, you’re in luck: you can rent a tree, adding a big dollop of convenience to the holiday fare. In San Diego, Adopt a Christmas Tree and in Portland, The Original Living Christmas Tree Company. San Francisco reportedly has (non-pine) tree rental through Friends of the Urban Forest, but at the time of writing this article no information could be found to confirm whether the program would be up and running for this holiday season. And for the truly determined, you can grow your own Yule To Be Tree for a future holiday. Sure, it will be six to eight years before you can cut down your own tree, but if you start now and plant one each year, you’ll have your own sustainable tree farm before you know it (assuming you have the space, of course). Even if you don’t plant your own tree, it would make a really cool gift idea. Swinging away from the extremes, what are the rest of us to do? Cutting down a live tree for a few weeks of holiday cheer hardly seems environmentally-friendly. Yet foreign-made, petro-chemical, toxic, landfill-fodder simply can’t be better...can it? Artificial trees are reusable...that alone makes them environmental...right? According to the National Christmas Tree Association, 28.6 million real Christmas trees were sold in the U.S. in 2006 (down from nearly 33 million in 2005). Dispelling the notion that Christmas trees are cut down from forests, Christmas trees actually are farmed much like any other agricultural crop. And like any other agricultural crop, there’s a strong chance that conventional live Christmas trees grow their seven to 15 year lives relying on the use of toxic pesticides and herbicides. So too, like any other agricultural crop, choosing an organically-grown Christmas tree is a better choice. Pine trees suffer attacks from certain insects that can stunt growth or cause irregularly shaped trees, and others that can curl or discolor needles. In addition, weed and grass growth around the trees also rob Christmas trees of nutrients and moisture, resulting in weaker lower limbs. Let’s face it, nobody wants Charlie Brown’s sad little tree in their house. Cue the toxic pesticides and herbicides, some which can be extremely dangerous according to the Organic Consumers Association. Yet there is some hope. According to the North Carolina State University Cooperative Extension, in many cases pesticides are used judiciously and fewer crops are treated each year. Herbicides, while still used on practically all tree acres, are used at a greatly-reduced concentration to merely stunt weed and grass growth, rather than eradicate it. In addition to certified organic Christmas tree farms and those that practice organic methods but are not yet certified, there is another branch of farming gaining recognition: Integrated Pest Management (IPM). While not organic, IPM is more environmentally friendly than conventional methods. Sustainable methods are practiced to help prevent or limit problems. There are set thresholds indicating what amount of a given pest or environmental condition is tolerable before action is taken. Weeds and pests are identified to allow both harmless and beneficial species to remain untreated. And when control methods are required, more environmentally-friendly treatments are attempted — such as pheromone use, trapping insects or weeding — before targeted spraying is used. Broadcast spraying of non-specific pesticides is a last resort. If you opt for a cut tree, once the season is over it’s important to recycle your tree (minus all the trimmings, the trappings). If you have the means, rent a wood chipper and you’ll have a nice pile of mulch for your garden. Otherwise, contact your local public works department to make sure they have, or can point you to, a program for recycling spent Christmas trees. Sure, those trees are biodegradable, but we don’t need to spread holiday cheer in our landfills, now do we? Artificial Christmas trees, 85% of which are made in lead-happy China, contain a myriad of environmentally-unfriendly materials, PVC and lead being the worst of all. However, they are Christmas convenience in a convenience-hungry society. Artificial trees — lead warnings and all — are lightweight, inexpensive and carefree. No watering a fake tree. No trudging about in the cold to find the perfect pine. No messy needles or dripping sap to muck up the happy home. No pine allergies to worry about with a fake tree. No wondering what to do with the tree after the decorations are off. Never mind those poor foreign workers earning scant wages all the while exposing themselves to cancer-causing compounds. True, most travel long journeys, gobbling up precious resources to make their way into your friendly neighborhood superstore. Sure, there’s the off-gassing and accumulated years of dust to cause respiratory irritation. But, artificial trees are reusable...that alone makes them environmental...right? With practicality and holiday cheer in mind, an organically-grown tree seems the best option. If you can’t find an organic live tree, it’s a standoff...sort of. 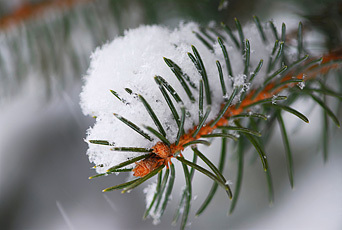 Check out Green Promise’s list of organically-grown Christmas trees and have a happy holiday.